As it is school holidays, I thought we would feature a child-friendly film, that could be fun for all the family. The film is released in the UK on the 17th August 2018. The main character Christopher Robin is played by Ewan McGregor. The film is made by Disney but is a departure from them doing a live remake such as The Jungle Book or Beauty and the Beast. The film is charming, and there is a lot of physical comedy from the fact that Pooh and his friends are in the real world. 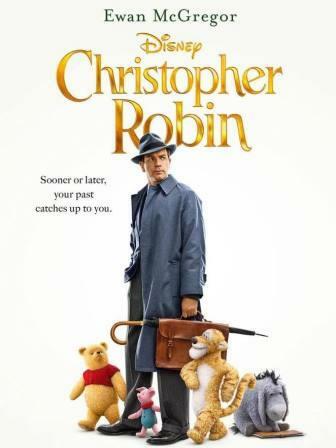 As a child Christopher had many adventures playing with his stuffed animals in Hundred Acre Wood. Now he is all grown up, but is struggling with past traumas, and his current job that he ends up prioritising over his wife and child. Pooh on the other hand has lost his friends, so he ventures back into Christopher’s life to get his help. Christopher finds himself at a juncture of needing to help everyone, and yet risking all that is dear to him. It takes the old gang of childhood pals to enter into his existence once more to remind him of the joys of family, friendship and the simple pleasures that can be garnered from life. The film will of course delight younger audiences and is definitely a rival to the popular Paddington franchise, but equally those of an older generation will love to get back in touch with the cartoon characters that they were brought up on. Images courtesy of Disney Pictures.